Best size aluminum boat for 9.9hp 2-stroke? Thread: Best size aluminum boat for 9.9hp 2-stroke? Going to be hard to make a recommendation. You've kind of put the cart in front of the horse. Most first decide on the boat than what to power it with. Would need to know what your plans for the boat would be. Will it be a back water boat or something for bigger water. Got all kinds of designs depending on function or versatility. All will have advantages and disadvantages. Unless you have to have the extra room of a 14' boat there's not a chance that you will get it up on plane with two guys and whatever gear you might have. Most 14' boats are rated from 20-25hp. There certainly are some fairly sturdy 12' boats out there that are rated up to 15hp, that's what I'd be leaning towards in your case. Plus you can get away with the box of a truck with a 12ft boat whereas a 14' gets much harder to handle without a trailer, but it can be done. Go with the 14ft boat. But you may be expecting more performance than a 9.9 can provide. A 12f isn't great except for fitting in a truck. With a 9.9 you are going slow unless on a car topper. Car toppers are poor for fishing. I’d put it on a solid 14’ and plan on traveling less then four miles on the water to fish. You would get about 10 mph. That motor mates pretty well with a 12' jon. Don't buy a big boat just to be disappointed when it doesn't want to get anywhere faster than trolling speed. Look at the specs for boats you are considering and make sure you're not over the transom rating (both power and weight) and in my opinion, don't go under 75% of the transom rating. If you want a bigger boat, I'd bite the bullet and upgrade the motor size. Just my opinion. To answer the question posted "Best size aluminum boat for 9.9hp 2-stroke?" A 12ft would provide the best performance with a 9.9. If you want more boat space then a 14ft would be better but would perform best with a larger motor. I have a 9.9 on a 12ft and it performs great with 2 full grown men fishing or hunting locally. I also have a 14 ft with a 25hp which fly's across the water which i use for longer trips or when I need to carry more gear/people. When i have the 12ft heavily loaded i can easily feel it pushing water lowering its performance greatly. The 14ft heavily loaded performs as if there was only passenger in the boat. Originally i did have an older 9.9 on the 14ft and it didn't take long before i upgraded the motor to a 25hp. It's not the size of the boat.. It's the weight in the boat ( and the weight of the boat itself) that will affect the performance the most.. a light 14ft will be better than a heavy 12ft.. also because the 14ft will have more surface area to float the boat on plane. 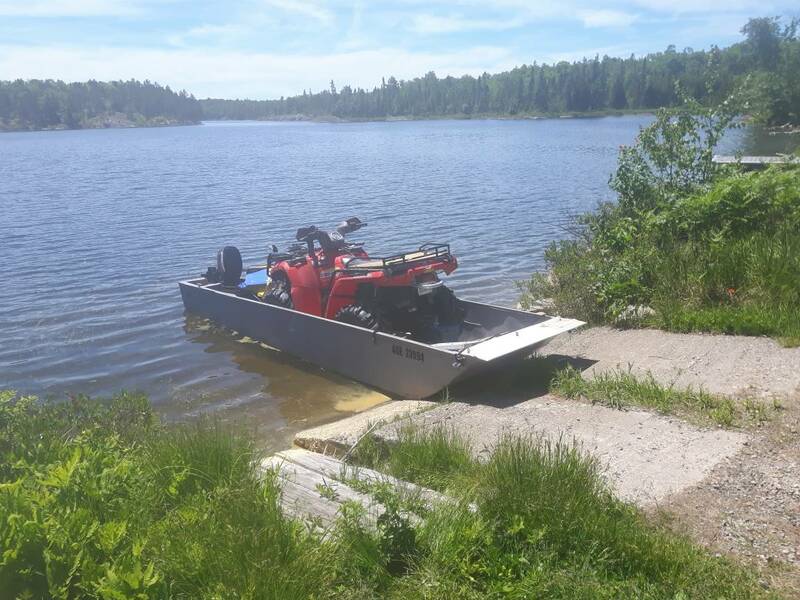 For example, I have a 14ft quad hauling boat nicknamed the Aquatruk.. regardless of if I use my 9.9, 15hp or a 25hp.. the loaded speed is pretty much the same (10km/h) unloaded speed is pretty close, each motor is only about 2km/h difference. I have worked from and fished from extensively both the 12' and 14' cartoppers for longer than I care to think about using nothing more than a 6 hp or 9.9 2-stroke. First, the 14 footer will always get up on plane faster and easier than a 12 footer because there is more weight forward of the motor. Secondly, your 14 footer will easily plane with a 9.9 while carrying two 200 pounders on board. My 14 ft planes easily with my 6 hp Evinrude but that's when I'm alone. It'll still come up on plane with 2 but it takes time and tends to be a slug in the water. The only restrictions you may have is on a large body of water that can blow up quickly. Thats when the 14 is a bit small. Now, I've fished with some guys who are inherently clumsy and exhibit zero sense of balance in a boat. These characters you have to shy away from but under most situations you will be more than safe. The 14's that I am referring to are those class of boats rated for a 15 hp or 20 hp max. I'll burn far less gas in my 14ft Princecraft than I will in my 12 ft Bluefin. Last edited by sawbill; June 26th, 2018 at 07:11 PM.